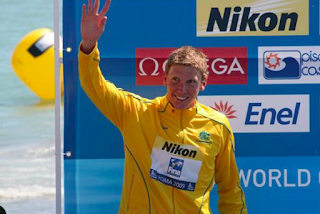 The Class of 2018 includes Trent Grimsey, the current record holder in the English Channel (at 6 hours 55 minutes) who was also a formidable professional marathon swimmer, world-class distance freestyle in the pool, and an extremely successful ocean swimmer who won dozens of races from his native Australia to Brazil. Daily News of Open Water Swimming: How does it feel to be inducted in the International Marathon Swimming Hall of Fame - even as you are still involved in the sport? Trent Grimsey: It does feel great to be recognized for what I was able to achieve in my sport. It's funny, all the things I was able to achieve in my swimming career mean a lot more to me now than they did back when I was swimming. 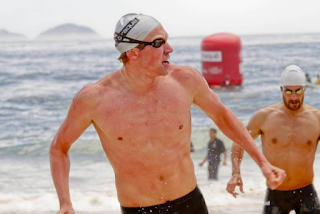 Trent Grimsey: I would say my most satisfying swim was in 2012 when I won the FINA Open Water Swimming Grand Prix (Traversée Internationale du lac St-Jean) in Lac Saint Jean, Canada. There is just something about that race - it's very special. At the finish line there are 5,000 people cheering you on! 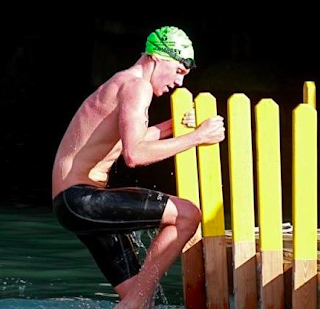 Trent Grimsey: The Robben Island Swim in South Africa. Daily News of Open Water Swimming: Can you describe your English Channel record-breaking swim? Trent Grimsey: To be honest it was just one of those days where everything went to plan. I had done everything possible to be in the best shape of my life to give that record a crack and was lucky enough to have had the conditions on the day to make it happen. Trent Grimsey: I was never really a talented swimmer and had no natural ability so I needed to train twice had hard to be on the same playing field as my competitors. My real strength was my drive and motivation. From 16 to 20 years old, I was swimming 10 or 11 times each week covering 90 to 100 km each week. From 20 to 24 years old, I was swimming 9 or 10 times each week covering 80 to 90 km each week. Daily News of Open Water Swimming: What is your most favorite place to swim, anywhere in the world? Daily News of Open Water Swimming: What are you doing now? Trent Grimsey: Now, I am coaching adult swimmers to help them achieve their goals of crossing the English Channel and other marathon swims around the world. Last year, I coached five successful solo swimmers across the English Channel. This season I have coached eight successful solo swimmers across the Channel. Next year (2018) will be a big year; I have 16 solo swimmers signed up that I am coaching. Trent Grimsey: I always feed on the same thing Gatorade and Endure gels... now I can't stand even looking at a bottle of Gatorade. Daily News of Open Water Swimming: What are some of the most beautiful beaches that you have seen? Trent Grimsey: Unfortunately, most of the marathons I have done have not been at beautiful beaches. Daily News of Open Water Swimming: What future swims, if any, are you thinking about? Trent Grimsey: I'm quite content now just coaching other athletes and helping them achieve there swimming dreams. I get the same excitement seeing one of my swimmers do well as I did when I swam well. Grimsey had a great run, especially in the 2008-2012 period. 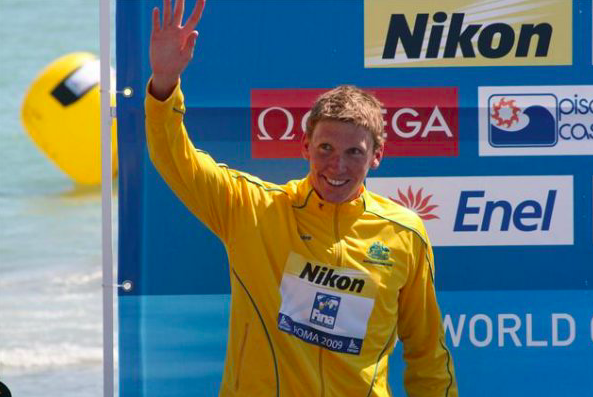 He won the 2008 RCP Tiburon Mile, placed second at the 2009 FINA World Championships 25 km race, was crowned the 2012 FINA Open Water Swimming Grand Prix champion, and set the record for the fastest English Channel crossing. "What most impressed me about Trent was how he was able to constantly improve over the course of his career. He transformed himself to be able to swim well in cold water and literally willed himself to set the English Channel record," said Steven Munatones. "I had the opportunity to cover Trent during the races around the world that he won, but I also observed him in many races where he lost and didn't perform to his expectations. He was always introspective on what went right and what went wrong during his less satisfactory swims. He was thoughtful when he could have just as easily been upset. He always set out to seek improvement and towards the end of his illustrious career, he achieved what he set out to do." And now he is sharing his experience and expertise via his platform Grimsey's Adult SwimFit. "Trent and the other new members of the International Marathon Swimming Hall of Fame emulate those exceptional 269 forerunners already enshrined in the Hall of Fame. Since the class of 1963, our marathon swimming inductees from around the world have received the ultimate marathon swimming recognition. They have been immortalized with their names inscribed on the IMSHOF Sea Goddess, our 'symbol of the sea'," explained Chairman Christopher Guesdon.